Uniflo 1000 is a volumetric temperature based conversion device, which achieves economic measurements without affecting quality and accuracy. It is equipped with a temperature sensor and has a low freq. input for the mechanical meter pulses. The device is small sized, easy to install on volumetric, turbine and rotary gas meters. It may be mounted on walls, as well. Uniflo 1000 complies to all the relevant european standards, like EN 12405 and MID Directive, and also to ATEX Directive for anti-explosive devices. Uniflo 1200 is a versatile volumetric PTZ conversion device, powered from battery or external power supply, suitable for both local use and AMR networks. It is designed and approved for ATEX zone 1 locations. 7 internal slots for optional boards are available inside, offering multiple configuration choices. 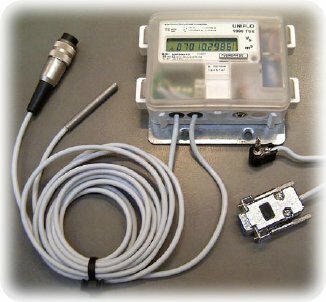 The device has capabilities for remote metering via GSM/GPRS or PSTN. It is certified to comply to all the relevant requirements of the MID Directive. 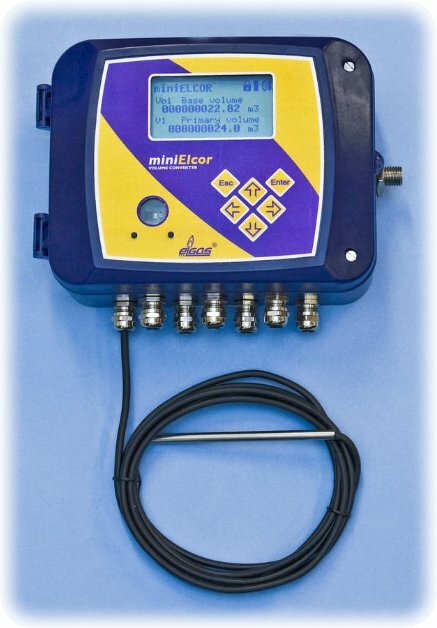 MiniELCOR is designed for the conversion of mechanically measured gas volume to standard conditions, according to the state equation. For that purpose, it reads pulses from gas meter and measures the gas temperature and pressure. It is available under PTZ, PT, TZ or T types. It operates on battery or, optionally, external power supply. All the actual and calculated values may be displayed on a backlight LCD screen, using a 6 button keypad. The communication to upper level system is performed via a RS-232/RS-485 interface, or via infrared communication head.